Posted: November 15, 2015 4:35 p.m. Updated: November 15, 2015 4:35 p.m.
An event organizer shares a dining moment with one of three turkeys at Sunday's Celebration For The Turkeys in Acton. 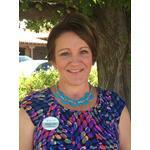 Photo by Jim Holt. An event organizer points one of the turkeys in the direction of food at the Celebration For The Turkeys event in Acton Sunday. Photo by Jim Holt. More than 100 people showed up for a Thanksgiving dinner Sunday and the ones thankful the most were the turkeys. As visitors to the Farm Sanctuary’s Los Angeles Shelter gathered around the dinner table, three white fully feathered and apparently hungry turkeys ate lettuce, cranberries and their favorite food - squash. At this Thanksgiving feast, the turkeys were the guests of honor. 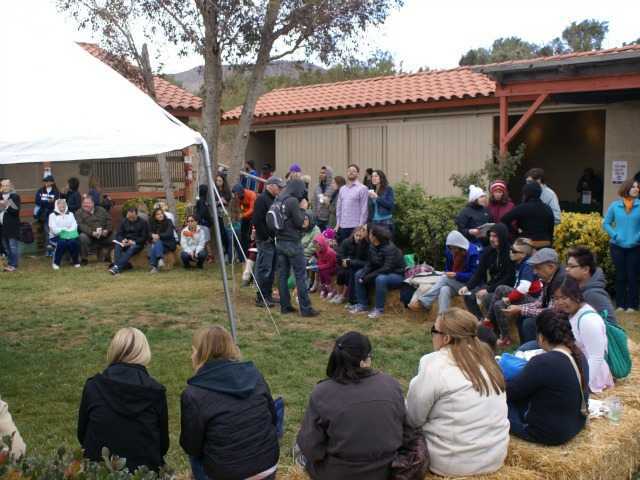 Billed as a Celebration For The Turkeys, scores of attendees - many of them children - descended on the Acton farm, on Escondido Canyon Road, to share the meal with “rescued turkeys” as opposed to sharing a meal of turkeys. They found a place to sit on bales of hay arranged around the turkey’s dinner table, ate some pumpkin pie and enjoyed a wide variety of vegan food available. “My daughter is a vegetarian and she loves animals,” said Tracy Jacobson who made the hour-long drive from Los Angeles to be at the special event. Her daughter, Samantha Staszauer, 12, said she was excited about being able to photograph the turkeys chowing down. 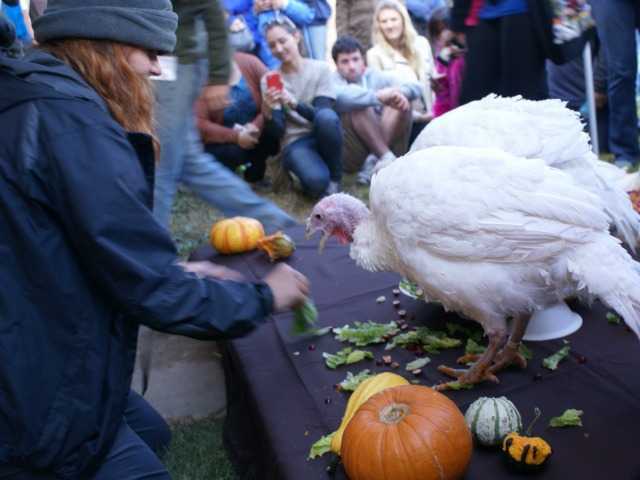 “At this one-of-a-kind event, rescued turkeys are the guests of honor and we treat them to a feast of their favorite treats like squash, cranberries, and pumpkin pie,” said organizer Meredith Turner-Smith. “Hearts will melt at the sight of these sweet turkeys,” she said. And, if the “oohs” and “ahhhs” voiced by attendees watching the turkeys eat was any indication, then hearts did in fact melt. Every year since 1986, operators of the Farm Sanctuary put the turkeys they rescue from abuse and neglect front and center for a day truly their own. Farm Sanctuary operators pride themselves as working for a farm animal protection organization that has three shelters located across the country, in New York and California. They rank among their supporters: Martha Stewart, James Franco, and Ellen DeGeneres, and Jon Stewart. Just before the “feeding of the turkeys,” Farm Sanctuary President and Co-Founder Gene Baur told attendees “Thanksgiving was a pretty tough time for vegetarians and vegans where the centerpiece on the table was the body of an animal killed.